Title: Cut Your Grocery Bill In Half with America’s Cheapest Family. Author: Steve and Annette Economides. Published by: Thomas Nelson, 2010. I found it very hard to put this book down! I am one of those frugal people who obsess about finding great deals so this book was a perfect read for me. The book is more geared towards adults. 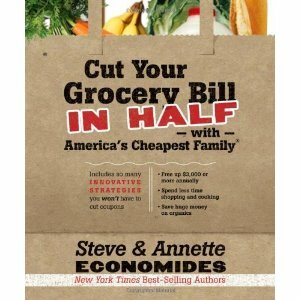 The authors, Steve & Annette Economides, offer a variety of tips throughout this book to help you save money. The authors are a married couple who throughout the years, have developed shopping, cooking, food storage, & several other techniques that work for them and their family. They explain how you may have to go to more than one store to find that great deal, but when you review the flyers and make a game plan, you will save money. They speak about avoiding “impulse buys”, which we have all fallen victims to sometime in our lives. As soon as we walk into our local grocery store, we find ourselves overwhelmed with all of the sale items that are near the entrance. This book explains some of the marketing tricks used to entice people to buy these items. While you think you are getting a bargain, you are actually getting less for your money. I love how at the end of each chapter, they offer tips for beginners, people in between, & for those who consider themselves experts on the particular topic they are discussing. My favorite section was the one about coupons. Most people I know (including myself), use coupons in order to save money. I found a lot of the websites they referred to & tips they offered to be very helpful. I also really liked their tips on how to organize a chest freezer. The picture they included was very helpful. Now I know how to store my milk, meats, & vegetables without having them take up so much space. The one thing I read which was not realistic to me, was the fact that they do one major shopping trip a month. How I wish in my wildest dreams that I only had to step foot inside of a grocery store once a month but for me (and a lot of other folks I know), it’s just not feasible. They describe how they go together to shop & are assigned particular sections in order to save time, but that is just not an option for many of the single parents out there. It would have been nice if they would’ve included more scenario/tips for single parents or those with small children who would have to perform all of those tasks alone. I had mixed feelings about the section in which they described how they cook in bulk to save money. Although I find it awesome that they are able to cook about 12 to 17 meals in one day, a lot of parents today just don’t have the time or energy to do so. They do offer recommendations for beginners to make it less overwhelming. I personally plan on trying it though because if it can save me time, I’m all for it! All in all, I found it to be a great book with a lot of useful advice on how to save money and time. They even have a bonus section with some recipes as well. I particularly liked the spice chart which lists all of the spices and what foods they are typically used to season. They even offer a section with tips on healthy and inexpensive snacks for teenagers! As the mother of 2 teenage boys, I know they can eat like there is no tomorrow, so I found myself giggling as I read. What I found very admirable about these authors is that they are very family-oriented and include their kids in everything they do. Not only are they showing them how to be smart about spending, they are also showing them how to become independent. I recommend this book to anyone who is interested in stretching their dollar and in particular, to families of all ages who are living on a budget. You can find this book on AMAZON!! Be sure to check it. Disclosure: I received a free copy of this book. All opinions are mine. Mother of 3 beautiful boys and married to the love of my life. My life is always crazy busy but I'm loving every minute of it! I love baking, reading, listening to music, and going to the ocean. I enjoy helping my children learn through fun activities and I encourage them to use their imagination through reading & play. Thanks for the great review on this!! I am still a newbie when it comes to saving money, but my husband and I have really been working together to cut our grocery bill. I love that we are spending less, he loves that I get excited about grocery shopping!! It is sometimes hard to cut on grocery bills: there are SO many temptations!! Stretching my dollar is always a good thing so finding solutions, like this book, to do that is always helpful. Stretching a dollar is important especially in tough economic times! 30 gallons of milk!! I understand that they are hard to store! Thanks for sharing your insights.